Like many people in late middle age, I find myself wondering if my next dog will be different. I have long shared my life with retrievers — active, field-bred dogs who throw themselves with joy into every situation (and every puddle of water bigger than a dinner plate). Their boisterousness is infectious: My dogs make me happy. But in 10 years, or 15, or 20, will I be up to the demands of dogs like these? Or will a nice, quiet little spaniel be the dog I need? My answer may be different than others, even among people of similar age (55), health (reasonably good) and activity level (decent, could be better). I live in a rural pocket near an urban center, and I can always walk out my back door and engage a bored retriever in a heart-thumping game of fetch in my horse pasture. But I won’t always be able to lift a sick or injured 70-pound dog, and that’s an unchangeable truth. These types of concerns explain in part the increased popularity of small dogs as baby boomers like me approach retirement age. So, yes, size does matter when you’re choosing a canine companion for your golden years. But so do energy level and health history. Energy level is important, because if you choose a small dog thinking he’ll be easier to keep exercised and entertained than a large one, chances are you don’t know anyone who has a Jack Russell. And the health history is important in choosing any dog, but especially so when you’re on a fixed income, as most retirees are. The health history may tell you about any preexisting health conditions that your dog may have, but of course, it’s not a guarantee that the dog won’t develop health issues in the future. An easygoing or at least kid-tolerant temperament is also a must, especially if you have grandkids over regularly. A healthy French Bulldog is a solid companion, especially if he can be with you all the time. While not exactly known for their athleticism (they tend to overheat easily), if kept fit and trim, the Frenchie is a wonderful walking partner. Sharing the bed may take a little getting used to, though, since these dogs tend to snore. 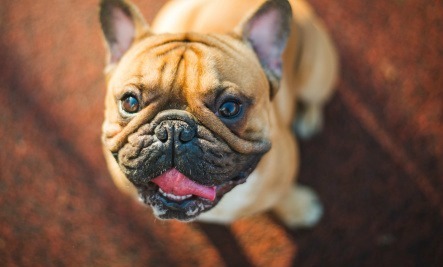 But in the eyes (and ears) of those who love them, that just makes the Frenchie more endearing. via 5 Best Dogs for Your Golden Years | Care2 Healthy Living.